Borrowing from the Biblical tale of Job, the story shows Sara’s current situation as an innocent child who seems to have everything in life that could possibly make her happy. She is very thankful to have her loving father, played by Larry the Cucumber, sending her to a French finishing school in London. The wishes of her father to enable Sara to pursue an education while he has to fulfill his responsibility as a soldier at war, seems to be the driving motivation behind why Sara has to relocate to this new environment. The song that Sara shares with her father during this time of transitioning to a new home (where she will live with other students learning how to be educated young ladies) is the perfect introduction to one of the main themes that will be seen throughout the story of Sara’s experience at the school. With a new and charming song, Larry tries to illustrate to Sara how she is a true princess, because she is a daughter of Christ, who is the king of Heaven. The duet between father and daughter also discusses the commandment of loving others even when it does not seem like it is the popular thing to do. Sara will soon find out that it is very difficult to be the unfortunate center of attention when others try to ridicule her. Thankfully, she displays kindness to all of the girls who she meets at the school, with a very loving and selfless demeanor. Sara is even successful at being patient with one girl in particular, Lavinia, when Sara is embarrassed by her in front of the entire classroom. It is a scene too many young children today can most likely relate to, when the struggle to be accepted by your peers is often such an emotional rollercoaster that every child faces in a new environment. Sara must realize how important it is for her to show love to others even when they are not nice to her. This part of the story is such a wonderful example of how these lovable little veggies continue to successfully bring home powerful messages to children of all ages in a simple language with catchy songs that are memorable and easy to understand. The characters that appeared throughout this enchanting story of Sara’s life as a “Penniless Princess” varied from some of the more familiar VeggieTales faces, along with developing a few more unique veggies who have only had very minor roles in prior veggies DVDs. I was so excited to see one of my favorite supporting veggies, non other than Madame Blueberry, playing the role of the assistant to the head mistress of the finishing school for young little ladies. Her main responsibility was established as helping to teach the students French. The scene when Sara revealed to the head mistress that she already had an exquisite development of the French language, along with the distinct accent, began the conflict that would lead to Sara’s confrontation with the head mistress. This was perhaps the fuel for the fire that started making Sara an envied student from the perspective of one of the other girls, Lavinia. Fortunately, the conflict between Lavinia and Sara allowed for Sara to show her love for others, even when these other individuals may seem undeserving of such love and understanding. Other important personality traits, such as patience, mercy, and forgiveness, were shown very clearly to viewers, when Sara chose to treat Lavinia the way God would want her to be treated. Many young viewers may be able to relate to the choices Sara was faced with in this story. Having to decide how we are going to act towards others who need our love and patience more than anything, even if they are unkind or may try to put us down in front of others, is not an easy task. Sara’s encouragement from the Bible story of Joseph, which she shares with her fellow student, Ermingard, actually incorporates a discussion about making these important decisions. Sara explained how Joseph chose to treat his brothers with kindness and forgiveness, even though they were guilty of badly mistreating him. I am so thankful, that Big Idea continues to hold true to its devotion to teach its viewers how the Bible can apply to the challenging situations that the characters are experiencing in the story. It was a heartfelt moment for sure to see how Sara tried to illustrate the Biblical lesson to her friend, “Ermie,” while the girls were sharing some time together up in the attic of the school house. The most controversial character to mention that fulfilled the role of the villain in the story was the head mistress of the school, seen as a tall scallion, who I could recognize from some other minor roles in earlier veggies DVDs. Her name, “Miss Minchin,” was comically delivered with such a scary tone when she first introduced herself to Sara’s father, and then was immediately followed by the shrieking sound of a horse in the background of the scene. This would become a pattern that continued consistently throughout the rest of the episode, whenever the head mistress’s name was mentioned. Although I truly found this to be humorous and innocent, parents may want to proceed with caution when showing the DVD to younger viewers. Speaking from experience that I had with my son, who was around 20 months old when we first watched the DVD together, the ominous deliverance of the villain in the story was so successful, that it actually caused my son to be very afraid of the character whenever she appeared on screen. I came to the realization that the frightening nature of how Miss Minchin’s personality was so serious and rather stern towards other characters in the story, unfortunately made it rather difficult for my son to enjoy most of the rest of the DVD. However, for children who are a bit older and able to grasp the wider meaning from the story and who can relate to the challenges of dealing with unkind individuals, I think that the somewhat scary character of Miss Minchin could also appear comical to this school-age population of viewers. She is clearly not meant to be evil or purposefully determined to mistreat Sara in the story. Instead, she appears to be an individual who has become hardened by her years of duty as such a prominent individual responsible for shaping the lives of young little ladies in London. The Penniless Princess DVD really did a wonderful job with the bonus features, from the standpoint of continuing to develop and discuss many of the themes and values highlighted throughout Sara’s story. My favorite feature shows five different points to remember when learning more about becoming a true princess. All of the selections work in Bible verses to support the rationale behind how Sara chose to act towards others, as she tried her very best to love others no matter what. In addition to the five points that are sure to provide excellent avenues for discussion among young viewers with their parents, I also thought that the “Tour of London” from the perspective of the French peas was a priceless addition to this DVD. Once again reminding me of the beloved story of Mary Poppins, Jean Claude and Philippe try to take the viewers through key moments of the story when they can further explain some of the cultural significance behind the development of Sara’s experiences in London. This also includes a segment about the teddy bear, Mortimer, which Sara’s father gives to her as his last gift before he goes off to war. These adorable features from the French peas allow them to take the stage more prominently, since they only have minor roles in the actual DVD. Even Bob the tomato, although normally a leading role in many veggies DVDs, also is only seen briefly as a minor character in the story. Not to be a spoiler, but it might be worth mentioning the possibility that some viewers might come away from the story thinking, “was Bob really only the baker in the story?” Fortunately, I think viewers of all ages will thoroughly enjoy this new installment from Big Idea, when they are given the chance to see just how effectively some of the other new VeggieTales characters are able to eloquently deliver the very special message about the importance of loving others at all times. Taking familiar stories and giving them a fresh and fun new spin is something the Big Idea Entertainment folks have been doing for years now with VeggieTales. The latest story to be given a modern twist is The Prince and the Pauper, but this time, it’s Princess and the Pop Star: A Story of Trading Places. For this tale, a young carrot named Princess who lives on a farm with her family is tired of her lifestyle and dreams to be just like pop star phenomenon Vanna Banana (get it?). Little does Princess know, Vanna actually wishes she had a life just like the family from the classic television show Little Peas on the Prarie. When the two happen to find each other on the playground one day, they decide to switch places. In the process, they discover that the life they wished they had instead of their own isn’t necessarily best for them. While the main characters of Princess and the Pop Star are girls, don’t jump to assume this story is for the little ladies only. The idea of coveting someone else’s lifestyle isn’t foreign to most people; whether it’s a job, location, or possession, most of us have found ourselves looking on the outside of another’s life and wishing to be them. Big Idea deserves kudos for putting such an important topic into a children-friendly message, which also can reach adults simultaneously. Of course, God’s will and call on our lives comes into play as well, as Princess’s mother encourages Vanna – while she’s posing as Princess – to be who God made her to be. It’s quite a clever and heartwarming spin on the story and lesson. As a VeggieTales episode, however, it doesn’t always feel like you’re watching VeggieTales. The young, female carrots take center stage, as well as other new characters who surround them, having Larry, Lunt, and the rest of the gang taking a backseat. In fact, except for the opening and closing, Bob the Tomato isn’t in the video much at all. 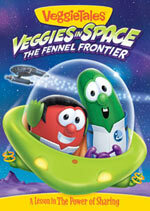 This alone makes it feel less like your usual VeggieTales story. Larry The Cucumber does get some good moments as Princess’s father at least, but he’s not the center of this tale. Madame Blueberry makes a great appearance as Vanna’s manager and there’s a fantastic “silly song” where Archibald takes the reigns on “The History of Fashion” to present the song “Astonishing Wigs.” It allows for a fantastic inside joke as Larry shows up at the end to offer a little rebuke to the usually serious asparagus for singing a song as silly as some of Larry’s own (to which Archibald has always given Larry a hard time about). It’s this kind of fun and humor (including a subtle “Stuffmart” reference during the “Pop Star” story) that remind you that the same geniuses that launched this show are still making quality lesson-filled entertainment. For anyone who has seen the grass as greener elsewhere than the blades under their own feet, Princess and the Pop Star is a cute and relevant story for their lives. While its core story doesn’t leave as much room for fun, boisterous and comical song numbers, kids should dig the pop tunes that Vanna and Princess sing in their stead. And although I did miss seeing some of the staple characters in this episode’s spotlight, it’s still a great entry into the VeggieTales library that teaches us to be thankful for what God has done in our lives and where – and who – He has called us to be. DOWNLOAD Coloring Pages for the Kids! The latest VeggieTales DVD, ‘Twas The Night Before Easter, releasing in time for the Spring holiday, is filled with so many important lessons delivered in a cheerful and kid-friendly manner, continuing the VeggieTales tradition of producing excellent media for children. The opening of the special begins with Bob the Tomato not being very good at finding Easter eggs, when he starts to think about what the true meaning of Easter really is. Larry is so concerned about all the jelly beans, giant cream-filled chocolate bunnies and eggs, while Bob tries to focus on the Biblical importance of Easter being about Jesus coming to serve others. An adorable young boy, Timmy, a Veggies fan who we see on Qwerty’s screen also wants to learn more about what is really important about Easter. The large golden egg that Larry finds leaves the audience wondering what is inside, as the story continues with a comical lesson about characters in a community who are searching for themselves to find the importance of helping others. With both Pastor Erwin and Marlee in competition to get Cassie to sing in their shows, Marlee gets the brilliant idea to add lots of spectacular attractions to her show. Some might think a giant robot-sized bunny is a bit over the top for some, but VeggieTales does not disappoint with the creation of Gary, the 20-foot robot rabbit who is Howard’s invention (Mr. Lunt)! I thoroughly enjoyed seeing the “turbo-charged hopper” bunny make his appearance when the auditions and rehearsals began for Marlee’s musical theater show. It is the creativity of VeggieTales that can create a fun new character as the centerpiece for this special that kids will find very amusing and action-packed! On a side note, I also found the nod to the Broadway show of “Evita” to be a sweet bonus in the show, when the cast of Marlee’s musical performs a number inspired by “Don’t Cry for Me Argentina” called “Don’t Cry for Me Easter Bunny!” Not to mention the musical treat from the French peas, Jean Claude and Phillipe, who perform a dazzling special of the latest dance craze called the Hopparena. Many viewers will recognize that familiar theme from the classic Macarena, that sweeped the nation years ago. However, the adorable bunny slippers and the bunny ears worn during the French peas’ dancing lesson attempt for Archibald Asparagus make this silly song another memorable one that young children will love to sing-a-long to! The true surprise of the show is when Marlee finds herself having a meaningful conversation with a mother at the local homeless shelter. She begins to realize that although she thought there was such amazing power behind the magic of musical theater, the only way to really reach people is to help them meet their needs. The lesson about God’s love for His people now becomes the focus, as the VeggieTales characters talk about the love of Jesus and how He came to serve others. I especially liked hearing the church choir sing one of my favorite hymns, “Christ the Lord is Risen Today,” when we see all the VeggieTales characters singing together. Pastor Erwin wraps up the service with a special message about Jesus’s death and resurrection, which really brings the Easter message home to the viewers. The ‘Twas The Night Before Easter DVD closer and wrap-up with Bob and Larry talking with Timmy also speaks about how Jesus is the most important part of Easter. Even though Larry’s large golden egg is empty, Bob reminds him that it is a great way to remember how it compares to the empty tomb of Jesus when he rose from the grave. Jesus giving his life as a ransom for many is a message that the viewers will take home from this wonderful new DVD that is a special new favorite in my family’s collection. DOWNLOAD Activity Page for the Kids! We’ve come to expect a lot from VeggieTales over the years and with their Summer DVD release, Sweet Pea Beauty, the team delivered another pair of great stories, but the production (namely the quality of the animation) was surprisingly more than just a significant step backwards. But with their Fall episode, It’s A Meaningful Life, the team is right back on track (and on par with the quality that Sweet Pea‘s predecessor, Pistachio, delivered). It’s common for the VeggieTales stories to be encouraging and inspiring, and to offer themes and lessons that kids and even some adults can really relate to. However, with It’s A Meaningful Life, not only is the story encouraging to children in several ways, but the theme may hit home a lot harder for most adults. First off, the story takes its central inspiration from the Frank Capra film It’s A Wonderful Life — even going so far as naming Larry The Cucumber’s central character “Stewart” after actor Jimmy Stewart, and his wife “Donna” after actress Donna Reed. But to make the story more their own, yet still familiar, Big Idea Entertainment also spoofs The Polar Express and A Christmas Carol in the process. Instead of an angel named Clarence, we have an angel named Gabe who picks up Stewart on a ghostly train that makes “three” stops, thus changing Stewart’s life. It tackles the big “what if” question that so many adults (and even some young people) struggle with during their lifetime. What if something did or did not happen? What would life be like? Would we be happier? It’s A Meaningful Life takes the source material’s theme and makes it much more God-centered, driving home the point that God’s hands are very much involved in every part of our lives and that, if we trust Him and follow Him, we are exactly where He wants us to be. And like in It’s A Wonderful Life, …Meaningful Life shows the central character how much just one person’s life can affect those around them. It’s an important lesson to learn and one that can be easily forgotten. There’s a good chance that this will help children have the right attitude when facing life’s trials in times to come, but it’s also most likely going to encourage their parents to appreciate what they have and have been given. There’s just one story featured on It’s A Meaningful Life, and the beloved Silly Songs With Larry sit one out for this episode. Instead, “Bedtime Songs With Junior” fills in as intermission and starts off as a seemingly slow and calming lullaby. 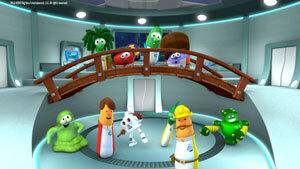 Thankfully, the VeggieTales crew does not disappoint and the song begins to pick up until it becomes a more worthy substitute for the “Silly Songs.” But since it’s not quite as looney or ridiculous as the usual, fun silly songs, it’s more a appropriate break from the more serious feature story here. There’s still a good blend of humor and seriousness in It’s A Meaningful Life. The Big Idea team still tosses in its usual random humor here and there to lighten up the mood (the TV commercial jingles, for example). Mr. Lunt stars as Bumble Bee, a football player who accidentally steals the glory away from Stewart — something that Stewart would regret for the rest of his life. When we see Stewart grown up, we find that he married his sweetheart and has three children – much like George Bailey does in It’s A Wonderful Life. However, before the story’s end, we learn that the littlest of Stewart’s family was actually adopted. And who better to voice an adorable adopted daughter than one of Steven Curtis Chapman’s adopted girls. Stevey Joy Ru Chapman does an exceptional job voicing the adorable little Emma, and it makes it all the more meaningful when Steven Curtis’ new song “Meant To Be,” which he wrote specifically for this DVD, plays over the credits. 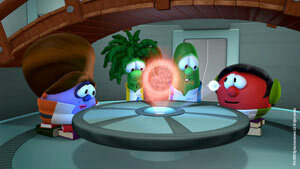 It’s A Meaningful Life is another great installment in the VeggieTales catalog of stories with important life lessons. It’s a fine mix of fun, serious, and even a little Christmas spirit as the Big Idea folks tackle “A Lesson In Being Content.” It’s well worth adding to your children’s entertainment collection — and a wonderful story that you’re likely to learn something from as well. Once upon a time, there lived a royally sour blueberry, a fair rhubarb maiden and a dastardly deceptive mirror! Sweetpea Beauty knows that what’s on the inside is what matters most, but insecure Queen Blueberry can’t see past her own reflection! So, when a decree is handed down that only the most beautiful can rule the land, the Queen gets nervous and things turn ugly! Banished to the dark forest, Sweetpea’s fate seems bleak until a charming prince, a band of merry minstrels and seven snow peas come to the rescue! Will Sweetpea and her friends be able to warn the Queen in time to save her from the clutches of the tricky mirror – or will the crumbling kingdom and the Queen’s own heart be lost forever? Find out in this fairy “Veggie” tale about the real meaning of true beauty. Plus, the almost-classic tale of…Snoodlerella. A self- conscious Snoodlerella is the star of the ball after getting an extreme makeover. Her life of glamour is short-lived as the clock strikes midnight and her glasses, braces and insecurities return. Will she be able to see herself as the good King sees her—unique, beautiful and perfect just the way she is? For the latest VeggieTales installment, the Big Idea Productions team bring a special edition aimed particularly at girls – a first for the popular family show. VeggieTales: Sweet Pea Beauty tackles the topic of beauty and outward appearance that girls especially struggle with, while using Larry’s own self-consciousness in this episode to make the story also relatable to boys as well (who often struggle with their appearance – not being “cool” enough or handsome enough – almost as much as females do). The episode opens in the veggies’ kitchen where Larry is trying on different hats in an attempt to find something that will help him feel better about himself. And when the gang’s trusty computer friend Qwerty introduces them to a fan asking about the subject of beauty (yes, Qwerty is given a voice for this episode for the first time… which actually seems to take away from the computer monitor’s charm a little bit), Larry and Petunia turn the episode over to Bob who begins to narrate the first tale, Snooderella. Snooderella takes the familiar story of Cinderella and gives it not only a VeggieTales twist, but a Seussian feel as the world of Snooderella looks like it was lifted from the page of a Dr. Seuss book. In it, we meet the rather plain Snooderella who is transformed by a “berry” godmother into a beautiful princess who dances the night away at a royal ball. But when the clock strikes midnight and she turns back to her brace-clad teeth and out-of-control hairdo, she feels ugly all over again. Luckily, the King shows up and assures Snooderella that she is truly beautiful because he made her that way. It’s a nice way to tie in God’s image of his children through the love of King Snoo. Before we get to the feature story, a new Silly Song titled “Pants” serves as an interlude. In it, Larry is on the Veggie Shopping Network trying to sell pants to his vegetable kind in yet another truly funny, truly memorable silly song. Not surprisingly, All Star United front man and acclaimed producer Ian Eskelin is a cowriter on the song (and performs the voice of the dancing pants). It’s one of the best silly songs to come along in awhile. The main story brings back Madame Blueberry as the very insecure and vain Queen Blueberry, who is entirely absorbed in trying to be the most beautiful person in the kingdom. When she awakens a magical mirror, it tells her that the most beautiful person in the kingdom is actually a young girl named Sweetpea Beauty, who is considered so beautiful because of her heart. Sweetpea finds God’s wonder and majesty in even the most smelly or unappealing things (her closest woodland friend… is a skunk!) and her charm begins to rub off on the kingdom’s prince (wonderfully played by Larry The Cucumber). But soon, the mirror begins to reveal an agenda of his own and the entire kingdom becomes threatened due to the vanity of the Queen. While Pistachio is the DVD’s one and only story, the “Silly Song” of this release is fantastically titled, “Obscure As always, the VeggieTales team successfully parodies well known stories and characters, and Sweetpea Beauty makes reference to Snow White, Goldie Locks and the Three Bears, and Sleeping Beauty. Snooderella played things mostly serious throughout its story (except for maybe the dance sequence), but Sweetpea Beauty enlists some wonderful comedic moments from the Seven Snowpeas and a pair of singing minstrels who even provide vocal thematic accompaniment for the final action sequence. It’s classic VeggieTales schtick! The only thing that really seemed to detract from the Sweetpea Beauty experience was the animation quality. The previous feature, Pistachio offered some of the most impressive animation to come out of the Big Idea Productions team yet, with wonderful shadings and renderings throughout. Sweetpea Beauty, however, bears a look and feel that seems maybe even a little unfinished. It’s not bad by any means, but compared to the previous episode, there is a significant enough difference that it was even a bit distracting. Regardless, I highly doubt the junior VeggieTales fans will notice or care, but it was obvious enough to come as a surprise to me. Hopefully this Fall’s It’s A Meaningful Life will look a bit more dazzling like Pistachio did. The Big Idea team, the brilliant minds behind VeggieTales, bring another familiar story to life with their vegetable characters in Pistachio: The Little Boy Who Woodn’t. Using the classic tale of Pinocchio as a base, Pistachio is a cute and smart story about an Italian toy maker whose latest creation, Pistachio, suddenly comes to life. And in true Veggie fashion, the Big Idea team load up the story with inside jokes, clever twists, and Biblical lessons that are perfect for any child. The best part about these stories, and especially this one, is it’s the kind of animated lesson for children that parents can watch along with them and enjoy just as much, or even more so. For example, with Pinocchio being such an age old fairytale, it carries a familiarity that parents and grandparents alike will be able to relate to. And in keeping with the VeggieTales tradition, all kinds of gags are inserted into the story, from references to Marlon Brando and Robert Deniro to Doritos, the board game Parcheesi, and even Monopoly. It’s the kind of formula that classic cartoons like Looney Tunes, or even Animaniacs from the mid-90’s, have utilized before — entertainment for all ages. Much like its source material, Pistachio has a pretty serious theme about disobedience and getting into trouble, which keeps the mood of the story a bit heavier than most VeggieTales ventures. However, the story never stops being fun and entertaining. When the mood needs a little lightening, the Big Idea team know just when and where to insert a great gag. Another fun aspect of the story is the return of Khalil the caterpillar from the 2002 Jonah – A VeggieTales Movie as a character named Cricket. Not only that, but the story itself takes advantage of the chance to make references to the feature film, and it’s a great little wink to longtime fans of the series. While Pistachio is the DVD’s one and only story, the “Silly Song” of this release is fantastically titled, “Obscure Broadway Show Tunes With Larry.” As one of the oddest song subjects you could imagine for a children’s DVD, the song featured is supposedly from the “unknown musical” Office Supplies, titled “Where Have All The Staplers Gone?” For the duration of the song, Larry and Esther sing about a large array of office supplies with wonderfully creative animation and sight gags – from singing highlighters and rubber bands to a 2D marker-drawn animated portion of the interlude. It has to be one of the most random but creative “Silly Songs” yet, even if children won’t be able to relate to even a hint of it (while their working parents probably will!). Lastly, the show’s bookends from the Veggies’ kitchen counter top fearlessly spoofs Extreme Makeover and pokes fun at “updating” the kitchen for the current times and technology. The tagline of Pistachio is likely to be the biggest selling point of the DVD – “A Lesson In Listening To Your Parents.” The story does a great job of driving the point home for kids to take their parents’ sound advice and learn to trust them. While the theme is anything but subtle, the Pistachio story wraps it in a fun and enjoyable little package that children will hopefully embrace and learn from. 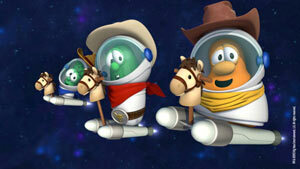 In the end, Pistachio is another fantastic VeggieTales adventure. Big Idea Productions continues to put forth the very best in Christian entertainment, setting a standard for what Christian entertainment can and should be. These aren’t just goofy, embarrassingly cheesy videos with a Biblical message, these are topnotch quality productions that are truly a joy to watch and share with the family. Big Idea does it again with Pistachio… and that’s no lie!